Benjamin Read, The History of Swanzey, New Hampshire, from 1734 to 1890, , at https://books.google.com/books?id=PSQz6tEv_54C . Salem, Mass. : The Salem Press, (1892) , p. 294. Thomas W. Baldwin, Vital Records of Wrentham, Massachusetts, to the Year 1850, Boston, Mass. : Stanhope Press, (1910) , Vol. 2, p. 413. "Massachusetts, Town Clerk, Vital and Town Records, 1626-2001," database with images, FamilySearch (https://familysearch.org/ark:/61903/1:1:FH48-C3B : 13 July 2016), Jacob Jun. 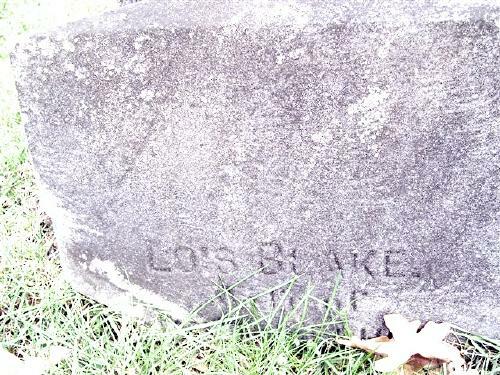 Blake and Roxey Blake, 22 Nov 1821; citing Marriage, Wrentham, Norfolk, Massachusetts, United States, , town clerk offices, Massachusetts; FHL microfilm 886,859. "Massachusetts, Town Clerk, Vital and Town Records, 1626-2001," database with images, FamilySearch (https://familysearch.org/ark:/61903/1:1:F42W-8M9 : 13 July 2016), Rosa Amanda Blake, 26 Feb 1823; citing Birth, Wrentham, Norfolk, Massachusetts, United States, , town clerk offices, Massachusetts; FHL microfilm 886,859. 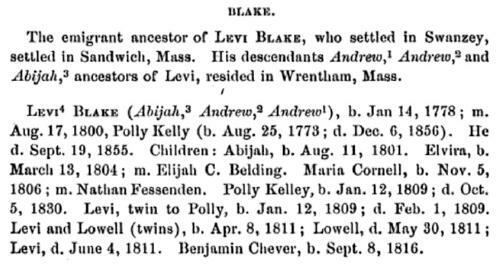 "Massachusetts Births and Christenings, 1639-1915," database, FamilySearch (https://familysearch.org/ark:/61903/1:1:VQD9-9QG : 4 December 2014), Mary Elizabeth Blake, 25 Jul 1824; citing WRENTHAM,NORFOLK,MASSACHUSETTS, ; FHL microfilm 0253249 V. 1. 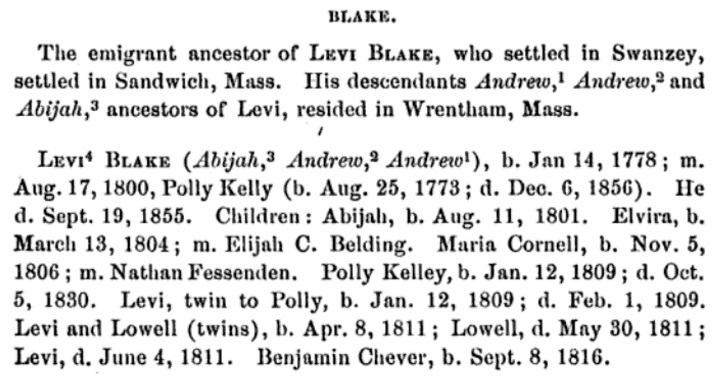 "Massachusetts, Town Clerk, Vital and Town Records, 1626-2001," database with images, FamilySearch (https://familysearch.org/ark:/61903/1:1:F42W-DLK : 13 July 2016), Jacob Addison Blake, 14 Oct 1826; citing Birth, Wrentham, Norfolk, Massachusetts, United States, , town clerk offices, Massachusetts; FHL microfilm 886,859.